I'm going to borrow from Emily Dickinson. *raises me pint* Love, Happiness and good health to ye! Happy Saint Patrick’s Day and May the luck of the Irish be with you. Not that the Irish are luckier than most, now. Tis just that even though it’s a country with lots of rain and at times lots of hardships, you will find among the people an optimistic attitude. Their focus is more on the rainbows that come after the storm than the storm itself! And the more you count your blessings the more you find you have. Do good luck symbols and charms work? Who is to say? Is it the object itself or the power they hold over a person’s mind… to get a person to focus on the luck, the dream, the wish…they believe the charm will bring them? In doing so, perhaps they themselves meet that goal. By having a physical representation of your dreams, of the hope of obtaining it...(even if it’s a routine, a favorite toy, coin or rock… or something more traditional like those below)... it makes your dream even more tangible, you feel some control of its outcome. Cats: Their excellent eyesight is believed to protect against approaching evil spirits. And studies have shown that cat owners do live longer healthier lives. Tortoise shell cats: Fur a mix of red, black, chocolate and cinnamon. Cats of this coloration are believed to bring good luck in the folklore of many cultures; in the United States these are sometimes referred to as money cats. BTW the color green and being around greenery lowers levels of stress hormone Cortisol filling you with optimism and can-do confidence… *sigh* if only I could keep my house plants alive!!! Gem stones: just a few lol could fill pages on them: Green Aventurine: known as the gambler’s stone. Citrine: known as the merchant’s stone, leave it in your cash box to boost earnings. Lapis for confidence. Rose quartz for love. Amethyst for protection. Blue chalcedony for creativity. Horseshoe: In Ireland they hang them points up to catch luck. In other countries they hang them downwards so luck can our out on you. KEYS. Three keys worn together symbolize the unlocking of the doors to health, wealth and love. OM: In Hindu mythology, Om or AUM is believed to be the first sound to pervade through the Universe at the beginning of time. Almost all Mantras are also initiated by reciting the word 'Om'. Worshippers of this sacred symbol are blessed with luck, material comforts and spiritual powers. Wishbone: since the 4th century various countries have held the turkey or chicken wishbone contest. Pulling the dry bone until it snapped “lucky Break” believeing the winner’s wish or dream would come true. Wishbox: Chinese custom of writing your wish down and placing it inside a decorated box. A prayer is said to amplify your wish. Then the box is sealed. Do you have anything you consider a lucky charm? Me? I have a favorite piece of a aventurine I keep nearby when I write and I wear my grandmother’s ring, turning it whenever I feel the need for confidence. Lucky charms or not… May your wishes come true except one, so you have blessings to count and still have something to strive for!!! As a writer, I get apprehensive when we submit something, hoping the editor will be in the right frame of mind and like it. Hoping the publishing house will have a spot for it. Then, if published, will the readers and critics alike, enjoy it. I can’t imagine what it would be like to have my book challenged or banned from shelves because someone didn’t like the content. I was flabbergasted. I thought the day of book banning had ended. We decided not to remove the books. It is a public school and you can’t discriminate because of religion. Besides the fact, we were all proponents of the constitution and the right to free speech. I am all for and, in fact, believe parents should censor what their children see on TV, the computer, video games, and yes… what they read. Making sure it is age or maturity appropriate. I watch shows with my kids, read the books they read, even play their video games and listen to their music. I want to know where questions and ideas are formed. It’s a way to have open dialogue and find ways to relate to them. But never would I dream of thinking something should be censored from society as a whole. If you don’t want your child reading something then you tell them no. That is fine, I respect your decision. But don’t tell me or anyone else what we should be allowed to read. By censoring you are just as guilty of forcing your beliefs on others as you accused the author. *blink* I didn’t realize it was such a long list and there are still a lot more! My mouth is hanging open reading the lists! Besides, what an adult or child gather from something can be totally different. ie how a child sees Pepe Lepew… compared to how adults take his humor… there are different perceptions. 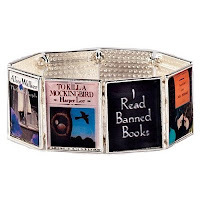 I have read banned books, have you?